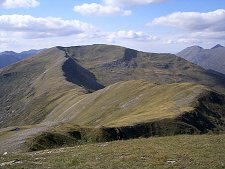 The South Glen Shiel Ridge maintains a height of at least 800m for a distance of over 14km along the south side of Glen Shiel and includes no fewer than seven Munros. 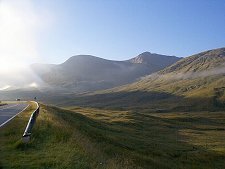 The route described here takes in the four eastern Munros on the ridge and is a wonderful day out for those not wishing to tackle the full set of seven. The starting point is at the car park either opposite the Cluanie Inn on the A87 at the west end of Loch Cluanie, or a short distance east of it at the start of a minor road south, where you can also leave your car. Wherever you park, this minor road that curves around the southern side of Loch Cluanie before heading generally south is your route in. Most of the guide books recommend following the road until you cross the Allt Giubhais then making a fairly direct ascent south to the summit of the first Munro of the day, Creag a'Mhaim. You can take this route. We did: but it is a hard drag up steep, sometimes wet, and usually trackless slopes. It is not a good start to what is going to be a long day out whether you are going for the four or the full seven. Next time we'll stick to the minor road until it meets a stalkers path at the foot of the south east ridge of Creag a'Mhaim. Once on the main ridge the going is open and easy, and the views extensive. 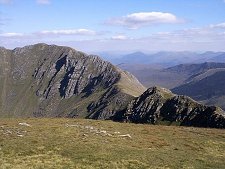 Your second Munro is Druim Shionnach, at which point the ridge curves slightly to the south before heading towards the impressive-looking Aonach air Chrith. This is the highest point on the whole ridge and an imposing summit with a precipitous feel. This is not a bad spot from which to take in the views. South you look towards the rugged back sides of Gleouraich and Spidean Mialach, with the odd glimpse of Loch Quoich beyond. 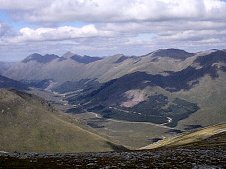 North, across Glen Shiel, lays the Five Sisters amongst many other peaks on view. If Aonach air Chrith is the high point of the walk, the descent of its west ridge provides the most entertaining section, and one that certainly keeps your hands out of your pockets. Airy in places, crumbling in others, and both airy and crumbling in a couple, this is a reminder that even the most benign of Scottish ridges need to be treated seriously. 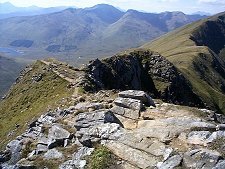 The trek from Aonach air Chrith to Maol Chinn-dearg gives you more opportunities to appreciate views that now include the latter's rocky western side. On Maol Chinn-dearg you have a decision to make: press on and take in the remaining three Munros on the ridge, or call it a day and head down the north east ridge back towards Glen Shiel and the A87. 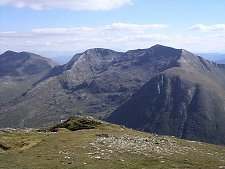 If you decide to take in the rest of the ridge, you're outside the scope of this particular guide, but a view of the next peak, Sgurr an Doire Leathain, is on the left. If you choose to take the easy option and head back down to the valley from Maol Chinn-dearg, you'll find yourself on one of the best descent routes imaginable: a nicely graded path that leads straight down the spine of the ridge before reverting to zigzags to gain the valley itself. The one slight snag with a ridge walk of this sort is that you finish up some distance from where you started: in this case about three kilometres. You might have had the foresight and means to leave a second car in the layby opposite the point at which the descent path meets the A87. Or you might just fancy finishing your wonderful day out with a three kilometre uphill walk along a very busy main road. The remaining option is to go to the "upstream" end of the layby and stick out your thumb. It took us - a couple, two young daughters, muddy boots, packs and walking poles - just twenty minutes to get our lift back to the Cluanie Inn. Beats the walk up the road every time. And it was the highlight of the entire holiday for our nine-year-old. Find out more from our hitch-hiking page. 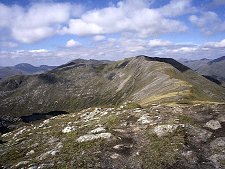 Maol Chinn-dearg is 981m or 3,258ft. 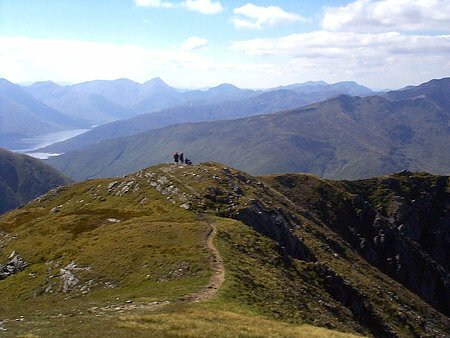 All except the West Top (which is a Munro Top) are Munros.